This handy Jolly Phonics Word Bank provides a comprehensive collection of example words for each of the 42 letter sounds (compiled by co-author of Jolly Phonics Sue Lloyd) which can be used for blending and identifying sounds in words (segmenting) practice with children. 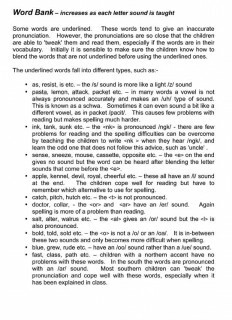 The example words are listed in the Jolly Phonics letter sound order. This is a fantastic resource for teachers to use in school or parents to use at home for reading and writing practice.